Add your Newcastle United Football Club Badge stampette logo to your Facebook and Twitter page and show your support for The Magpies. 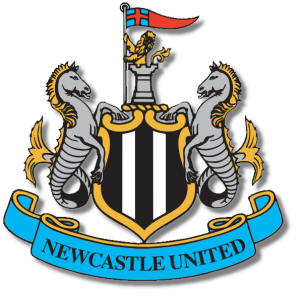 The club was founded in 1892 by the merger of Newcastle East End and Newcastle West End, and has played at its current home ground, St James Park, since. They have won four League Championship titles and six FA Cups, as well as the 1969 Inter Cities Fairs Cup and the 2006 UEFA Intertoto Cup. Newcastle United has the eighth highest total of major honours won by an English club. The club's most successful period was between 1904 and 1910, when they won an FA Cup and three of their First Division titles.